Bicycle friendly communities don't start with bike lanes or share the road campaigns or cycling education; they start with a visionary leader. Last night, the League of American Bicyclists recognized Mayor Bob Foster with the first-ever Bicycle Friendly America Leadership Award for his dedication and vision to transform Long Beach into one of the nation's top cycling cities. Since 2003, more than 500 communities have used the League's Bicycle Friendly Community program to make cycling safer and more comfortable for millions of Americans. But few cities have made the quick and impressive progress Mayor Foster has led in Long Beach. Combining vision and action, Mayor Foster has worked to expand the city's bicycling network, increase bicycle education, promote cycling events -- and more than double the number of bicycle commuters over the past four years alone. "Perhaps the most essential ingredient to building great places for bicycling is working with strong, supportive leaders," said Andy Clarke, President of the League of American Bicyclists. "An industrial city transforming itself into a cycling destination, Long Beach has already risen to Silver-level Bicycle Friendly Community designation -- and, with Mayor Foster at the helm, we know that's just the beginning. As the first recipient of the Bicycle Friendly America Leadership Award, Mayor Foster is setting a high bar for the rest of the nation." Launched yesterday in conjunction with the Pro Walk Pro Bike conference in Long Beach, the new Bicycle Friendly America Leadership Award program recognizes key civic and business leaders -- from mayors and CEOs to governors and university presidents. Winners are chosen by the League's BFA team in consultation with local bicyclists and stakeholders. "Over the past decade, we've been inspired by incredible leaders across the nation who have taken the BFA program to new heights," said Bill Nesper, the League's Bicycle Friendly America program director. "This awards program will highlight and honor the individuals who are making a different where the rubber meets the road, using the tools of the BFA program in new and effective ways to build a bicycle-friendly American from the ground up." 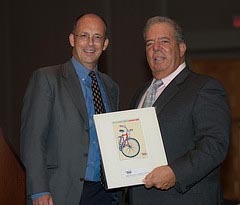 "I'm honored to be the first to receive the Bicycle Friendly America Leadership Award," said Mayor Bob Foster. "I rediscovered cycling three years ago and now I ride at least 100 miles a week. I share this recognition with the growing number of residents who use their bicycles instead of their cars. Together we will make Long Beach the most bicycle friendly city in the country." Learn more about the Bicycle Friendly America Leadership Awards at bikeleague.org/bfa. The Bicycle Friendly America program provides incentives, hands-on assistance, and award recognition for communities, universities and businesses that actively support bicycling, and ranks states annually based on their level of bike-friendliness. Learn more. The League of American Bicyclists promotes bicycling for fun, fitness and transportation, and works through advocacy and education for a bicycle-friendly America. The League represents the interests of America's 57 million bicyclists, including its 300,000 members and affiliates. Learn more.